The iPad is a very powerful system for music creation, but it lacks any way to get music in or out of it. Numerous companies have tried to create iPad docks for this purpose, docking the iPad to a platform that has the connectivity that music creators demand. So far most of them have fallen pretty flat. 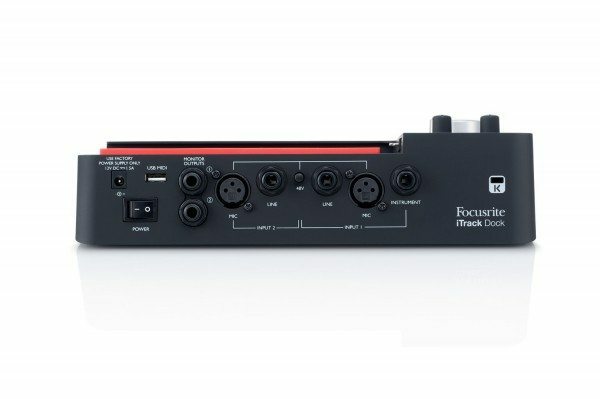 One new product, introduced at NAMM this year, promises to be the Holy Grail of iPad music production; the Focusrite iTrack Dock. Designed to fit any of the iPad models (4, Air or Mini) with a Lightning connector that slides to accommodate your particular model, the iPad sits firmly in place at a comfortable angle for work. The front of the device has gain and monitor controls and indicator lights for power and 48V phantom power for condenser microphones, which this dock provides. The rear has two XLR microphone inputs and two 1/4″ line inputs and a button for the 48V phantom power. There are also two monitor outputs, a USB MIDI connector for hooking up your MIDI gear to the iPad (a feat that has always required some gymnastics to perform on the iPad), a power switch and power lead input. The thing about this that really sells me is that this has the same microphone preamps as the Focusrite Scarlett 2i2, which provide plenty of power to drive an Electrovoice RE-20 dynamic mic with room to spare and a dead quiet noise floor. Not only does it work with any Core Audio compliant app on the iPad, it even comes with its own simple recording app called Tape which does instant recording, mastering and sharing, ostensibly in an easy format. The Focusrite iTrack Dock is not available yet but it can be preordered through several outlets. Amazon.com has it for $199.99. Expected release date is the end of April, so keep your eyes and ears out for this potential game changer! The ultimate iPad studio? Focusrite iTrack Professional Dock for iPad originally appeared on The Gadgeteer on April 4, 2014 at 10:00 am.